Setting Default Permissions prior to inviting members to your workspace will save you a lot of time down the road. If, for instance, you invite 10 members to your workspace without having already set your default permissions, you would have to set permissions for each individual member for the workspace and the portfolio - that is 18 times more than is necessary for every member. This guide will walk you through the process of setting your default permissions for the Collaborative Workspace, as well as for the Collaborative Portfolio within your workspace. 1. 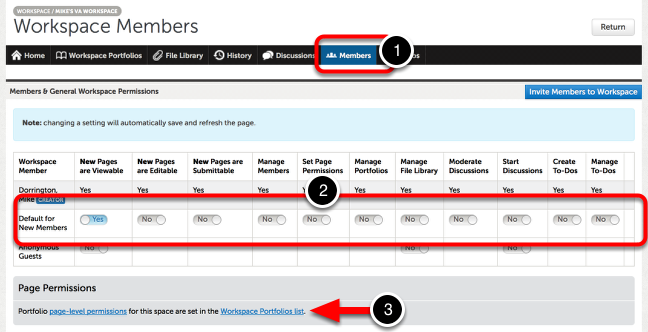 Navigate to the Members tab in your workspace. 2. Adjust the settings in the Default for New Members row. 3. 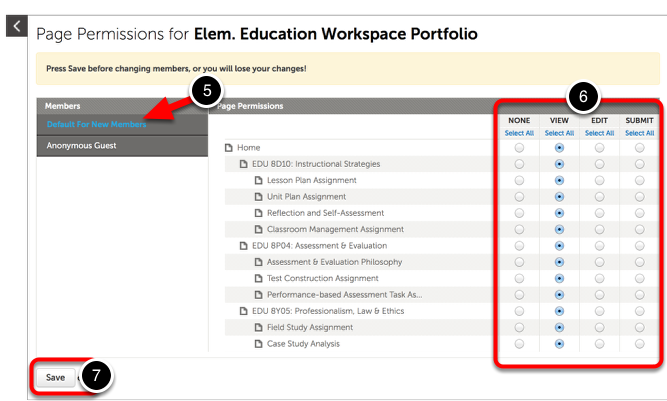 Click on the Workspace Portfolios List link to access your Collaborative Portfolio to set defaults. 4. Click anywhere on the portfolio to reveal its options and select Permissions. 5. Ensure that Default for New Members is selected. 6. Select the page-specific settings for your default. NOTE: Whichever level you choose (none, view, edit, or submit) will grant the members with those permissions, and the permissions below it (i.e.. the "submit" level will allow the user to view and edit in addition to submit).